Healthy Apple Crisp Muffins- no oil, no sugar, no dairy, no flour! Healthy Apple Crisp Muffins- oil, sugar, dairy, and flour free! Muffins are an easy and highly portable breakfast/snack option but are typically laden with sugar and oil which can make them less than healthy. I’m always looking for ways to make things a bit more nutritious and try to avoid refined sugar, bleached white flour, and butter when I can. Don’t get me wrong it’s not that I never make anything with butter, flour, or sugar, heck I love a good ol’ fashioned shortbread cookie and couldn’t live without making some of those around the holidays but I do try to make small changes when I can to ensure that we eat healthy whole foods as a family! I made these oatmeal muffins without flour, dairy, sugar, or oil and they turned out so well! My family ate the whole batch in 2 days!!!! They are made with apple sauce, whole grain oat flour, almond milk, chunks of apple, and natural honey. Bananas/applesauce keep the muffins moist instead of the usual oil or butter. A bit of honey sweetens the recipe instead of refined white sugar. These can be made using gluten free oats to make them gluten free and the best part, you can customize the batter to make your favourite muffin flavour! I used chopped apple and shredded zucchini for this batch and they were really good!! Zucchini is a great way to sneak in some extra veggies and it also helps to add moisture to the batter without using oil or butter. I did add a crumb topping to mine which my kids absolutely loved. I mean who doesn’t love a little oat crisp on top?! The extra sweet crunchy oats really add another layer of deliciousness. You can omit this however if you prefer. I love this recipe because you can get creative and add your favourite add ins. 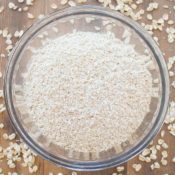 I have used this basic oat muffin recipe a lot and like to swap out what I put in them to switch things up! frozen blueberries *Tip-I keep mine in the freezer until the very end when I’m ready to add them to the batter, then I rinse them in cold water and pat dry. This will keep them from turning your batter blue or purple! Add dry ingredients (including the ground oats and 1 cup whole oats) to wet ingredients and mix until just incorporated. Allow these to sit for 10 minutes to soak the oats. Optional: Fold in approximately 1 cup fruit (I like them with lots of fruit! ), raisins or nuts. 1/3 cups coconut oil (in liquid form)- add an extra 1-2 tbsp if your mixture seems too dry once mixed. Whisk the coconut oil and honey together until smooth. Place the rolled oats, pecans, almond meal, cinnamon, and salt in a large bowl. Add the coconut oil and honey mixture; stir until combined. Add your mixture to the top of the muffins just before putting them in the oven.